The Rexel REM820 Micro-Cut Shredder is ideal for shredding highly confidential and secret documents, either in a small office or home setting. The shredder shreds an A4 sheet into approximately 2000 pieces, producing a very small shred size of just 1.9 x 15mm. This gives it a high P-5 security rating, suitable for secure shredding of legal or financial information. With the REM820 you can shred up to 8 sheets of 70gsm paper at a time (or 7 sheets of 80gsm) and the front-opening 21 litre bin will hold up to 220 shredded sheets, a good capacity which means you shouldn’t need to empty the bin too frequently. In addition to your paper documents the shredder will also securely shred CDs/DVDs and credit cards. When shredding your confidential documents, you don’t even need to remove staples and paperclips as it will get through these too. Other features of the shredder include: Rexel Mercury Jam-Free Technology (a sensor measures the thickness of the stack you are about to shred and an LED warns you if it is too much paper); a large bin window so you can see when the shredder is filling up and will need to be emptied; castors so it can be easily moved; and ultra-quiet operation. 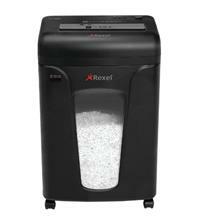 For your peace of mind, the Rexel REM820 Micro-Cut Shredder also comes with a 2 year warranty.